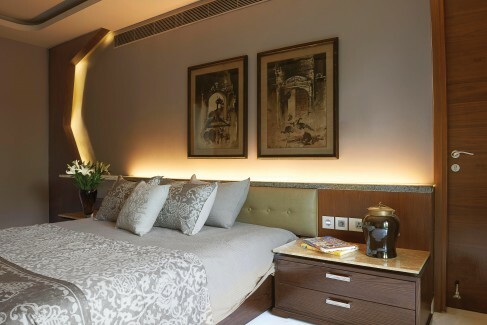 New Delhi-based Untitled Design are masters at realising sustainable projects that dexterously marry elegant functionality and traditional artisanship. Untitled Design is led by Amrita Guha and Joya Nandurdikar. 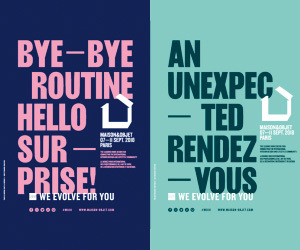 In over a decade of existence, the firm has worked on residential, hospitality, and commercial projects, and scooped up a whole bunch of awards. The team’s signature style includes placing sustainable solutions at the centre of highly-individualised visual aesthetics. The following three projects represent the firm’s most remarkable work. This home spreads across 12,260 sq ft and four levels, which could mean that its luxurious girth becomes its identifier. Except that it doesn’t. The clinchers here, instead, are the commitment to traditional construction styles and the creation of a cool micro-climate using natural elements. 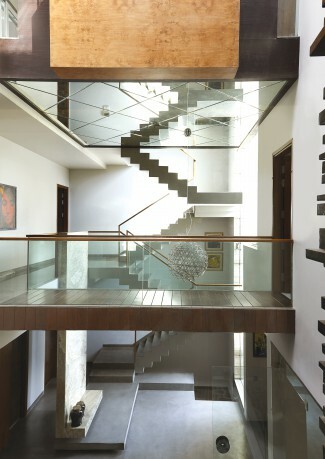 Bridges connect two monolithic sections of the house and at the centre is an atrium dominated by a beauteous water feature. 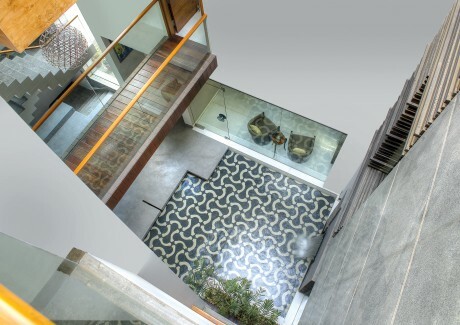 “The revival of the age-old traditional terrazzo was painstakingly executed by artisans from Gujarat in black and white cement without using any partition strips in the entire 16’x14’ space,” states the team. The water body comes alive in a shaft space, its cooling effect wafting through the spaces, even as the remarkable floor’s reflection moves across the surfaces. A water spout in this section flows out of a towering, textured micro-concrete wall. 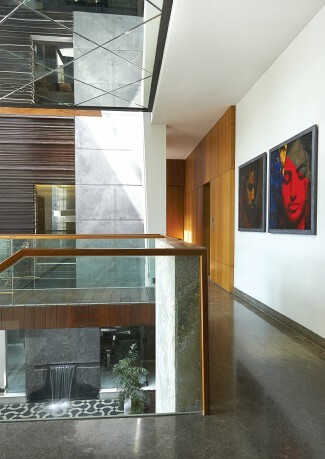 In this universe of gleaming glass, brooding concrete and polished wood, the stand-out is the wall-art, which is mostly from the client’s enviable collection along with some local works added in by the design team. Helping the passive quality of the home are the double-glazed aluminum surfaces and windows, a VRV air-conditioning system, double-glazed insulation, and a terrace garden. The Untitled Design team’s love for patterns is easily visible everywhere, especially in the upholstery and cushions collection, and in the luxurious granite spreads. Living in this home will feel like living in a cool cavern curtained by waterfalls – that soothing sound and feel of water omnipresent! The living room of this home will draw you in. The main wall has been adorned using an array of small timber blocks affixed with bowl-shaped brass creations. The effect is quietly impressive, which is clearly what the whole project aims at establishing. 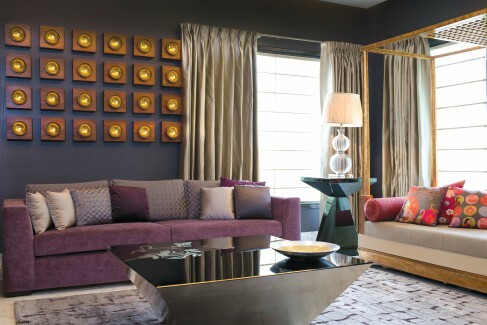 The team from Untitled Designs has imbued this space with deep, sumptuous colours that are left largely undisturbed in their natural glory. 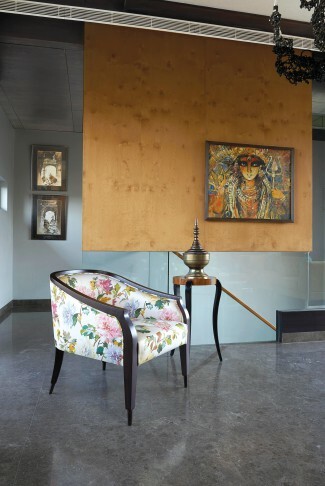 The careful avoidance of wildly contrasting hues, textures, and accents within a room is a definitive element here. In the living room, for e.g., the main couch’s soft regal purple is complemented by the brooding grey blue wall, the patterned rug, and the long cream satin curtains. The room is primed for the residents’ social life, but with a fine taste for elegance. Then, there is the mirror mural, specially created by an artist, that injects some illusory magic into the setting. 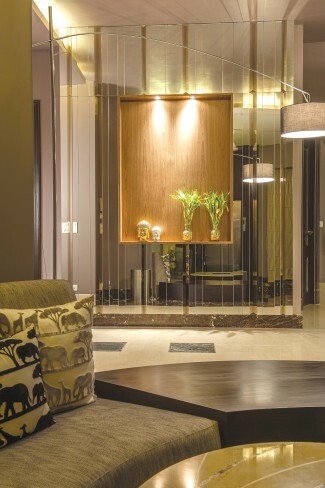 “The client demanded a calm space to refresh their mind and emotions, where they could re-energise themselves after a long stressful day,” the team states about the home. As easy it is on the senses, the team has also paid particular attention to creating spaces for all sizes of gatherings – from large rooms to passageways to courtyard space, every section can be used to entertain guests. The dining room, with its American walnut veneer-paneled wall, matches the framed art on the wall with identical line-stamping on the shiny table. It is an interesting trick in distinguishing the room. 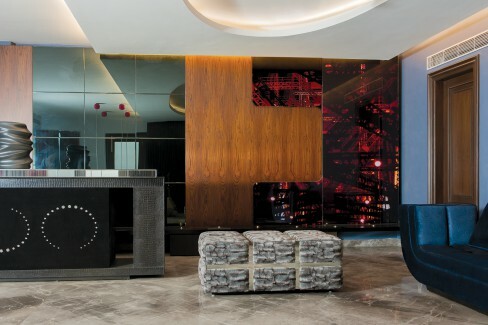 Indeed, well-picked and comfortable furniture pieces form the centre of this design universe. And keeping them company are some beautiful walls – paneled, wallpapered and textured to create unique corners – as well as trendy cushions and upholstery that travel the print range from jungle totems to Indian kitsch. This structure is a museum masquerading as a home. 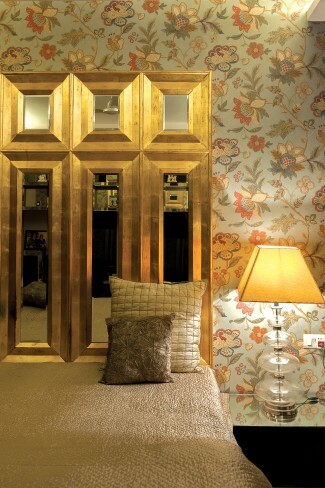 “Our only brief was to infuse the space with panache and sparkle of frothing champagne,” the team flamboyantly admits. The 6,500 sq ft space is dotted with, as the name suggests, objects of art. 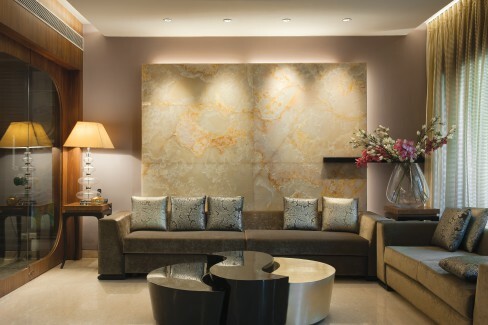 It starts in the foyer, where a triple-leveled, 40mm-thick Gwalior white stone wall channels the traditional Chinese symbol of prosperity. 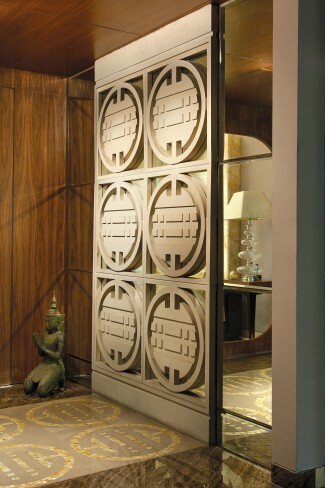 The mother-of-pearl inlay of the same symbol in the flooring here establishes a luxurious permanent reflection. 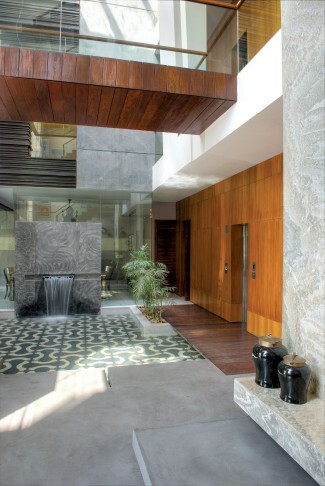 The base of the staircase is enlivened by a water body, a familiar element used by the team, and made further intriguing by a ledge crafted from abalone shell that seems to rise from the water and stretch out. “Balinese style of stone masonry was adopted while depicting a ‘tree of life’ in the shaft area which was executed by artisans from Jaipur with much effort. The bed in the son’s room was created as a sculptural element, with a head board depicting Australian aboriginal art,” the team adds. The puja room door is a vision – it depicts a whirling ‘Maha-Raas’ scene, created using Mathura’s endangered ‘Sanjhi’ craft style. Sitting at the suede leather and Swarovski bar would be entertaining in itself, but the backdrop of Howrah Bridge’s night-time aerial shot doesn’t hurt one bit. This is the second floor, connected by a glass bridge, and featuring an outdoor area that has a fireplace and is flanked by water bodies. The client as well as the designers are sustainability-conscious, so VRV air-conditioning, LED lighting, and open and green patches have been made essential parts of the plan. This home is testimony to the possibility of building comfortable homes that are conscious of their carbon footprint too.